A small park behind the Gold Country Inn and Casino. Most of the spots appeared to be used by full time residents. Our spot was wedged between two 5th wheels that look that they have been there for some time. Two cars in front of both so backing in was a bit tight. The space was just wide enough for the coach and when we put the slides out they hung over the neighbors picnic table on the drivers side. Across from us was a school bus. It was a Friday afternoon so no surprise when our neighbor pulled up with a case of beer and iced down the cooler under his canopy. Sounded like the party was about to start and we could hear every word inside our RV with the windows up and A/C on. 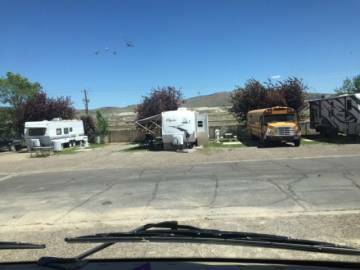 DW looked at me and said she could not stay, we checked and found a spot at Iron Horse RV park, just down the road.